The Chicago Tribune headline read: “Willie Wilson bails out inmates charged with misdemeanors in bid for reform,” but one commenter suggested a different headline: “Willie Wilson unleashes criminals back into society.” Wilson, a Chicago businessman and politician, recently posted bond for six Cook County Jail detainees, also giving each $200 for necessities, and while some praised Wilson for his actions, others were quite harsh in their criticism, suggesting it was a slap to victims and a danger to society. Wilson paid $500 or less to spring each of these men. Lacking the resources to raise $500 had been the only thing keeping them in jail. Meanwhile, last week Donnie Rudd, a Chicago doctor accused of murdering his wife, came up with $400,000 to post his bond. Is Rudd more deserving of his freedom because he has money and the other men don’t? According to our criminal justice system, the answer is yes, but perhaps that will change. Americans are starting to agree that the United States incarcerates way too many of its citizens (more than any other country), but if people balk at posting bond for a few men charged with misdemeanors, how will they feel about the dramatic changes needed for genuine reform? 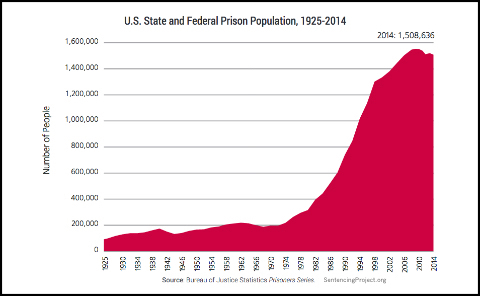 Reducing our incarceration rate to where it was in the 1970s and where it is in most countries would mean 80 percent fewer people behind bars. If such a prospect sounds scary, remember: That is normal; this is not. To move our criminal justice system toward a morally defensible state, step one is admitting that it unlawfully and unethically discriminates against the poor, not to mention the less educated, the mentally ill, the black and the Hispanic. To deny this is to pretend the earth is flat. And it is people who don’t fall into those categories who must fight for change because doing nothing is supporting this discrimination. Albert Einstein said, “The world is a dangerous place, not because of those who do evil, but because of those who look on and do nothing.” Our current national shame isn’t a product of those in prison, but of those outside it. And if it’s tempting to condemn prisoners as just criminals and let yourself off the hook, remember the words of Buddha: “As rain falls equally on the just and the unjust, do not burden your heart with judgments but rain your kindness equally on all.” And that includes the millions hidden behind prison walls. Thank you for lifting up this issue Deborah. The inequity of the criminal justice system is galling. I’ve been appalled lately by stories of people who have been jailed for being poor; simply unable to come up with the money to pay court fines. Debtor jails were supposed to be a thing of the past but it seems that they have created a back door system for accomplishing the same objective. As people languish in jails unable to post bond, they lose jobs, cars, homes and relationships. Their lives can be effectively destroyed with no guilt having been established. It’s time that we speak out to level the playing field so it is not only those that can afford it that obtain a “get out of jail” card. I applaud the work of Willie Wilson, and I’m glad to know there are individuals out there like him who put action behind their convictions. Good job. I liked how you went a different route and talked not just about mass incarceration but the profit factor in mass incarceration. That’s something we seldom hear about. And the Buddha quote was right on point. Thanks for thought provoking article. Thanks for this specific critique of the so-called justice system in our country. I hear frequent comments about the racial discrepancies in U.S. prisons (regarding the disproportionately high number of Black men, in particular, who are incarcerated) but I hear less about the economic piece of it. Thanks for lifting it up. I too had finished reading an article on for-profit prisons. I had no idea! Of course we incarcerate more citizens than any other country – there’s money to be made. I can’t imagine anyone gullible enough to believe that mixing money and the application of laws could ever result in justice. Thank you for a timely and powerful article. The title says it all. Thank you for uplifting the issue of financial inequality into the realm of our justice system. I wonder if money talks what is it saying in this case? Justice is only for those who can afford the dues? Have we created justice as some sort of exclusive club? Hi Deb, I really appreciate how you have taken on this distressing issue and noted the disparity between how we view the wealthy accused versus those without similar resources. I have been reading on the problems with for-profit prisons and how that exacerbates the unlawful and unethical discrimination and targeting of the poor in our justice system. Thanks for offering this perspective and for framing it with those powerful words from Buddha.